The 1980s was a great decade. 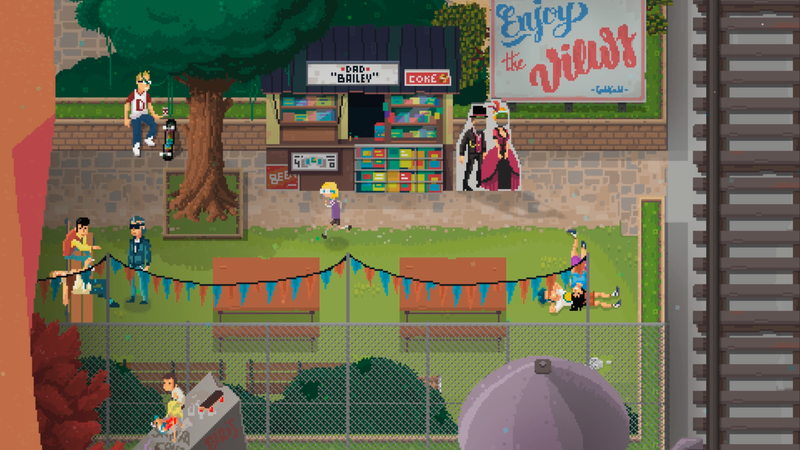 Cool clothes, radical music, awesome cartoons and, most importantly, the arcade! Almost everyone can say that they enjoy something from the 80s. That might be the reason that I was so drawn to the game Crossing Souls. 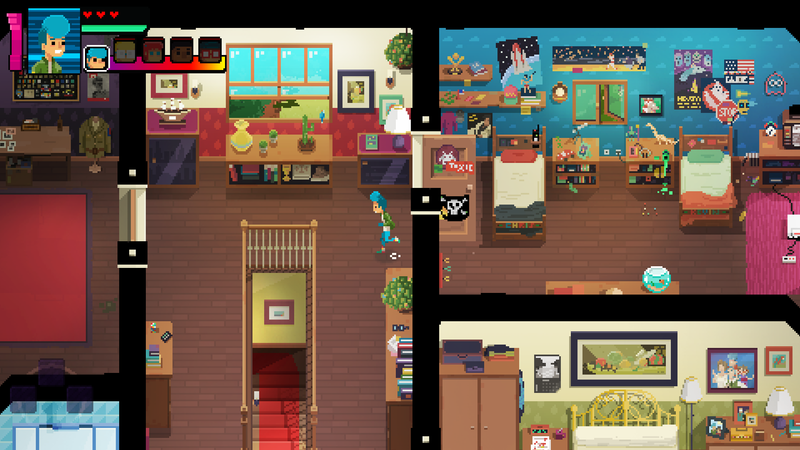 Crossing Souls is a new action/adventure game that was released earlier this year by indie developers, Fourattic. Take a trip back in time to the 1980’s California suburbs and help Chris, Matt, Charlie, Big Joe and Kevin save the world from a supernatural event that spins wildly out of control. Set in 1986, Crossing Souls begins when a group of five friends stumble upon a mysterious relic called the Duat Stone. 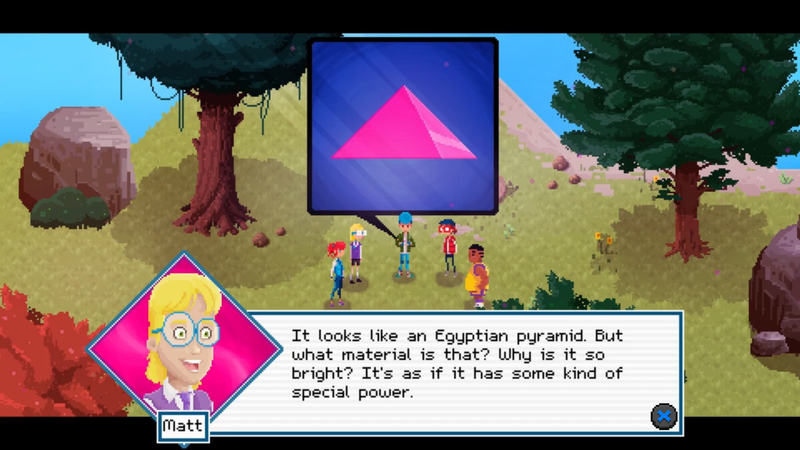 After doing a bit of research on the Duat Stone, Matt (the “geeky” one) is able to create a machine that utilizes the stone’s power. This allows the group to see and interact with the spirits of dead people. The first time you power up the machine you actually run into a couple of cavemen ghosts from the beginning of time. 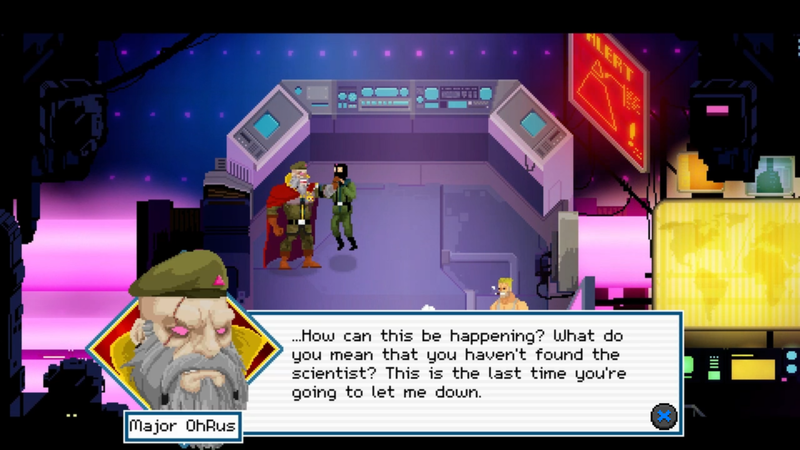 The dialogue is pretty comical and there are tons of video game and 80s pop culture references throughout the game. But the story can get pretty serious and emotional at times. See, this Duat Stone is very important to a very big, scary group of people who want to take over the world and they are willing to kill anyone who stands in their way. So you can see where things might get a little… messy. A lot happens throughout the story. Not only will you be dealing with the angst of five preteens but you’re also trying to save the world from a powerful, deadly army. Ruled by a ruthless leader who calls himself Major Oh Russ. Fight off his vicious infantry of monsters and other-worldly creatures, solve challenging puzzles, engage in strategic boss battles and learn the real meaning of friendship. 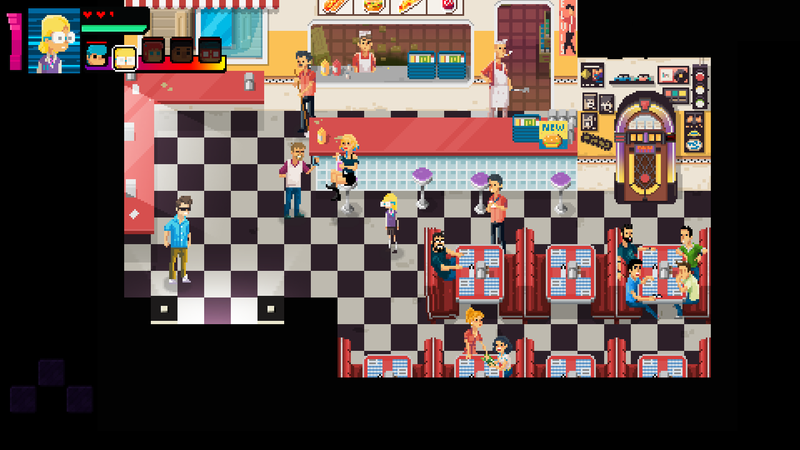 Speaking of fighting, you’ll be fighting enemies off in real time. So no random encounters or turn-based battles here. As much as I enjoy games like Earthbound and Final Fantasy, I hate being interrupted and having to wait for my turn. So, if I can avoid that it’s a plus. One thing I liked that is similar to the Earthbound series is that the group follows each other in a line formation and each one has a different personality and attribute. For example, Big Joe is obviously the loveable strong arm, Charlie is the tough girl that they all have a crush on, Chris is the courageous leader, and Kevin is the annoying younger sibling. You can easily switch between characters with the press of a button and use their different weapons and skills to your advantage. Difficulty-wise, I thought that most of the enemies were pretty easy to ward off. Once you get the hang of things and find a character you like you’ll breeze through most of them. Boss battles are a little more difficult, but it’s a welcome challenge in my opinion. There were a few times during the game when I would get frustrated having to cycle through the characters so much. Matt can hover for a brief period of time so you’ll need him to reach far away areas. Big Joe can clear a path by moving heavy objects. Chris can climb up ladders or other pliable surfaces (I don’t know how that is a special ability). 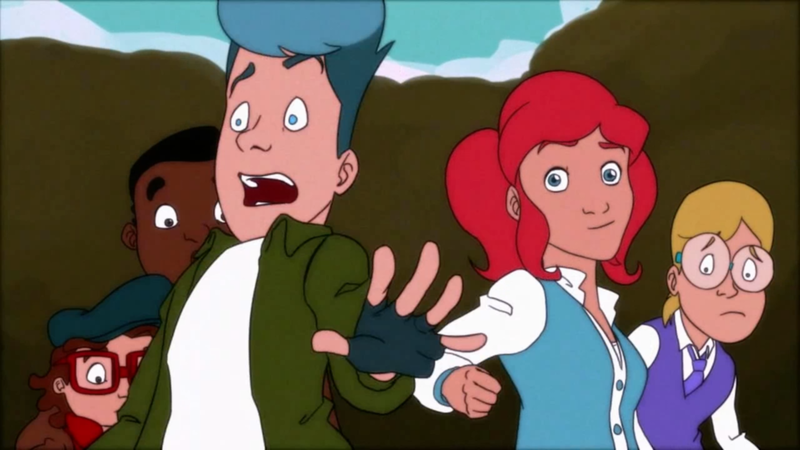 Charlie can launch herself like a slingshot, allowing her to reach new areas, and Kevin? Well, Kevin doesn’t do much in the beginning of the game but he gains an ability a little later that will help out the group immensely, but at a cost. Playing as one character throughout the entirety of the game is impossible. You will use each character’s abilities numerous times and sometimes you’ll be switching between them so much it might even get a little confusing. But really, that’s my only big complaint. Aside from the cheesy jokes and overused nostalgia triggers, Crossing Souls is a much more in-depth game than I anticipated. When you finish an area in the game the player sees a short animated scene that sets up the next chapter of the story. Usually it’s under a minute and includes some nice, 80s sounding music playing in the background. I saw one of these scenes when I watched the eShop trailer for Crossing Souls. the animation reminded me of a cartoon I used to watch called The Magic School Bus, and that alone had me pretty intrigued. But I was sad to find out that these scenes don’t appear as often as I had assumed throughout the story (nor do they include dialogue). Aside from that, I absolutely love the whole pixel thing going on here. Crossing Souls is so simple looking, yet it is a feast for the eyes when it comes to the little details scattered throughout the world. The game is even equipped with a pretty sweet soundtrack as well, so all around I’d give the visuals and music a 10/10. 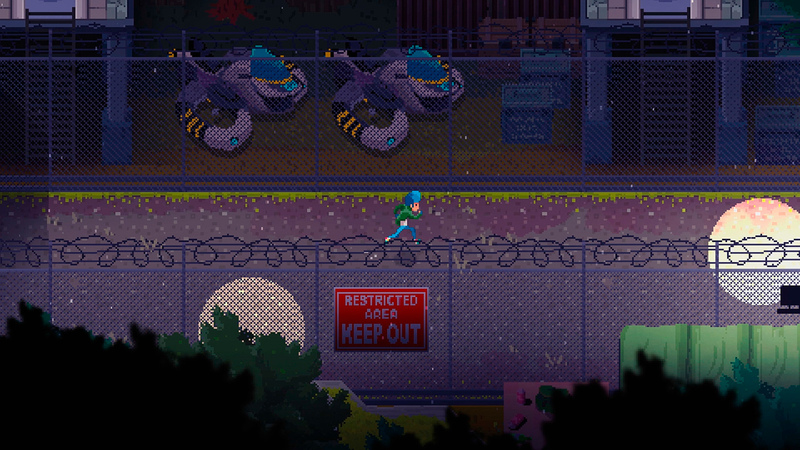 Crossing Souls also has quite a few different areas to explore with a good variety of scenery and characters. Even though their personalities are all a little bland they offer up some funny, memorable dialogue once in awhile. There are also some neat little collectibles scattered throughout the world. You can find VHS tapes that parody popular movie titles from the real world, as well as video game cartridges and secret classified documents. I liked collecting these just to see the titles. One of my favorites was a game that looked like Duck Hunt for the NES, but this game was titled Human Hunt (By Ducks). I’m glad they added these fun collectables because there really isn’t much else to focus on besides the main story and a few optional side quests. 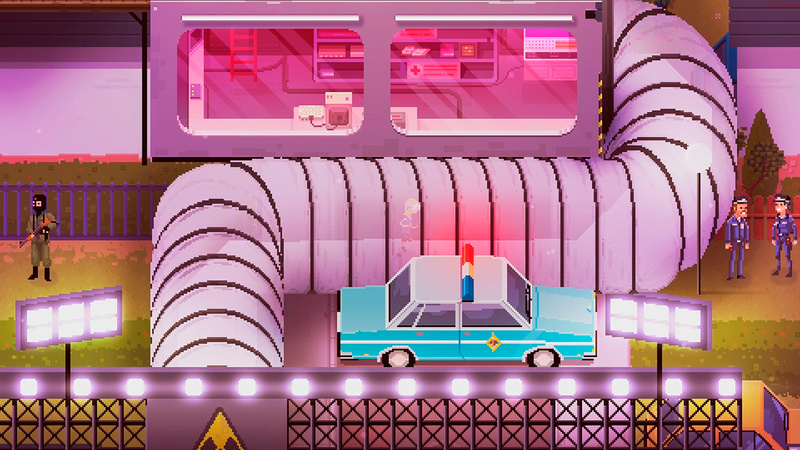 The storyline is very similar to the Netflix series Stranger Things, so if you’re a fan of that then you’ll probably like what Crossing Souls has to offer. I’m sure you’re thinking that there is enough of the 80s going around, you don’t need something else to remind you of your feathered hair or parachute pants. I would agree with you, but how many games can you say cover these topics or reference these things? Sure there is a plethora of movies and TV shows set in the 80s, but in my opinion there really aren’t enough video games with the same concept. My final conclusion is that Crossing Souls has a lot to offer. There are a few irritating parts of the game and some cheesy references that are a little overplayed, but overall I like it. 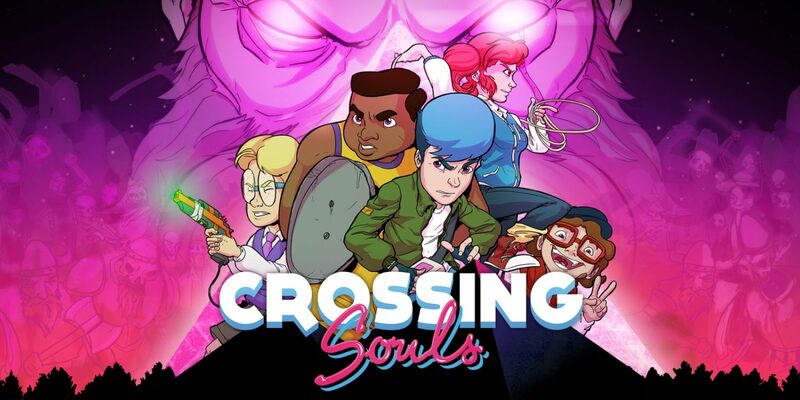 If you’re craving a good, affordable game ($14.99) that will keep you interested until the end I highly recommend Crossing Souls. Check it out now on the Nintendo Switch eShop. I had a lot of fun playing Crossing Souls. The game turned out to be a lot more than I thought it was and even though I’d seen the references and heard the jokes, I could relate to it. Not to mention how much I love the overall look and sound of the game. It leaves you wanting more, but in a good way. Hello! My name is Kaelyn, and I LOVE Nintendo! I can't remember a time when I didn't play video games. Growing up with 3 older brothers it was hard to avoid them. Nintendo was always something that put me in a good mood, or taken me away when I needed a break from reality. My favorite series is the Legend of Zelda! I've always been into drawing Nintendo characters and seeing other people's video game themed art. I have a dream of one day meeting the great Shigeru Miyamoto, and one day working for Nintendo (Don't we all).